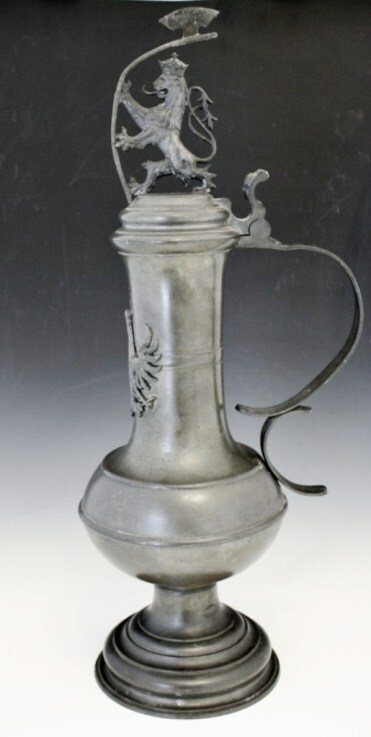 Weygang beaker – ebay ad said: 18th Century Pewter Gothic Wine Goblet footed w Gargoyles – Marked W-A 1726-Rare. So sorry sport……Wrong! 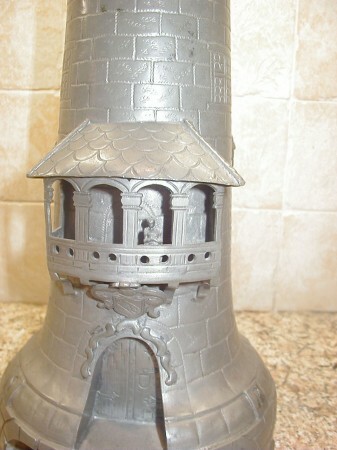 A Weygang tower, 16 inches tall, sold on German eBay for $535, plus shipping (4-1011, which i thought was a good buy.) 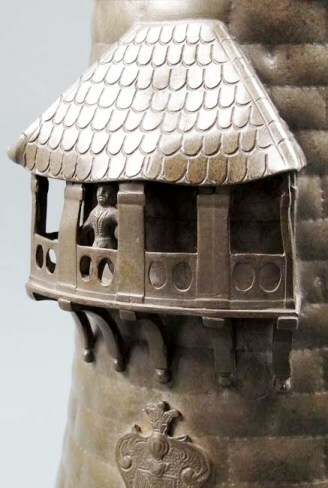 The copper turret had been polished brightly, but strangely enough not the copper casement windows. Copper awning over pewter balcony. [L] Weygang mark and [R] One of the Weygang Rosettes. 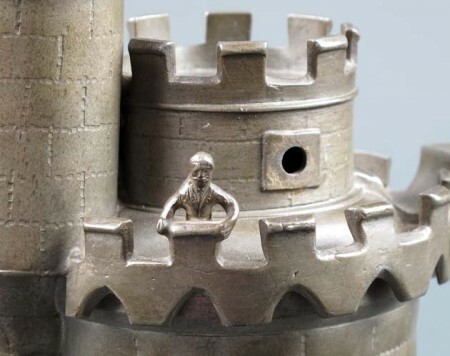 The addition of a little man to the roof of the tower is I believe, only found on the largest towers. The size and design of the balcony changes also with size. Most all little men on smaller towers are found only under the awning. A slightly different version where the little man is on the top platform of the stein and the man under the awning is in a different position. 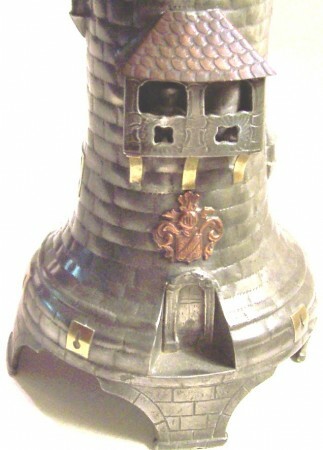 Yet another version [FWTD] at 12 inches tall, copper turret top, copper awning (smaller than the one just above), and copper coat of arms above the door. This also comes with a couple of small brass plates with what appears to be “key holes” in them. Not! 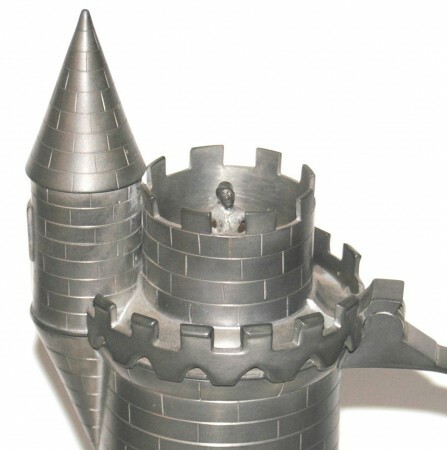 Those are ‘gun windows’ and were installed in most antique castles after the musket proved to be a good defensive weapon. The little guy in the attic window on this one is great, as is the walk around platform in front of the awning. 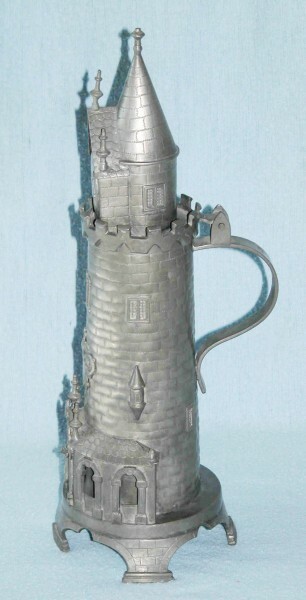 A very large tower [FWTD], 16 inches tall and too big to drink out of, with all sorts of stuff going on. Barred windows, Gothic spires (one missing) and that big clock! 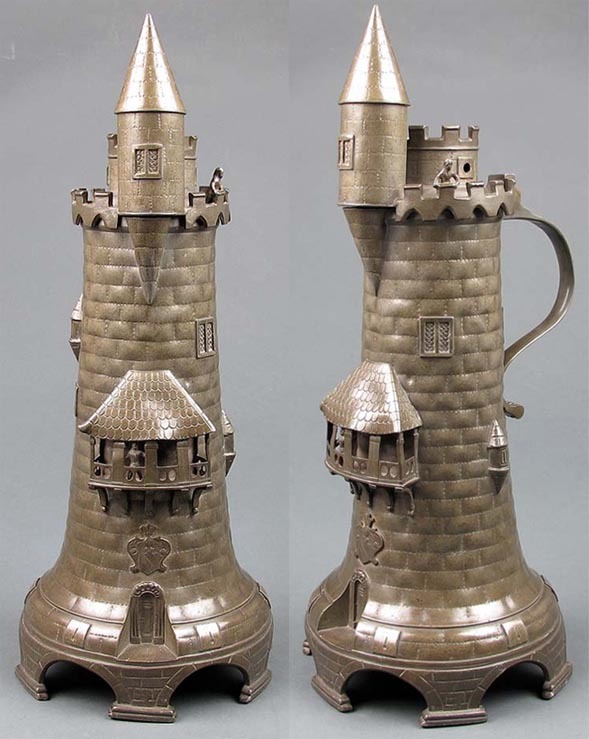 I do not have the measurements on this tower, but I could believe it is the biggest Weygang tower stein ever made; possibly 20 inches tall. It appears to have been parts of a couple of tower molds placed together. It also has the little man on the top walkway. 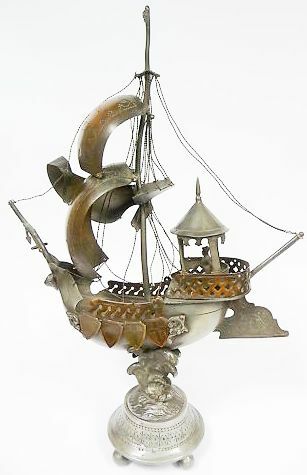 Nefs are large table center pieces that look like ship. 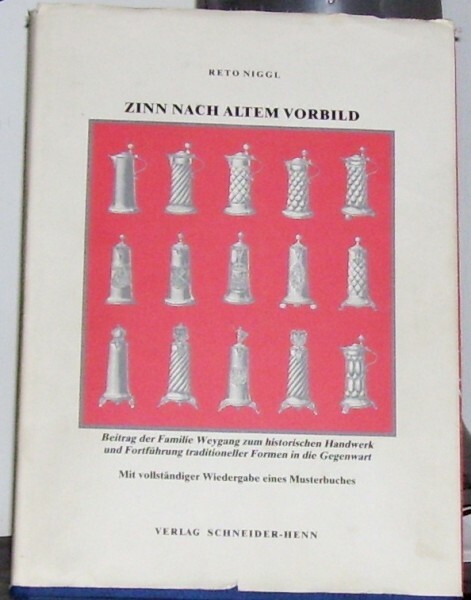 In the very eraly days they were made of silver,quite small and the top lifted off so one could use the Nef as a “welcome cup.” The Nef shown is not illustrated in the book “ZNAV” but six very similar ones are. The little figure of the ship’s pilot is reminiscent of the dude on the tower’s walkways. 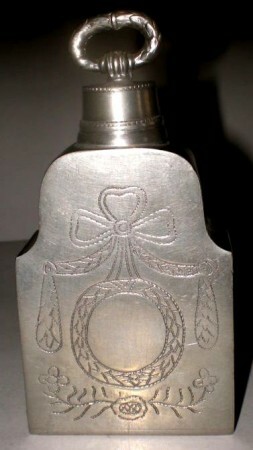 An true antique, engraved, not molded relief, “Schraubflasche” (Screw topped flask.) Dated 1694. [FWTD] Shown for comparative purposes against those below . 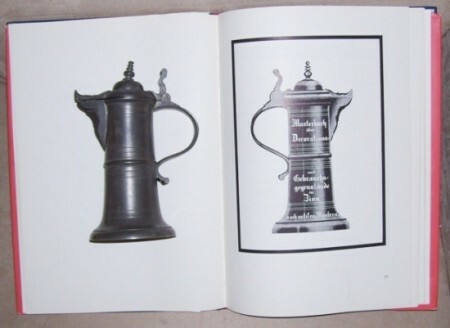 Also shown in the book ‘ZINN NACH ALTEM VORBILD (but not in the artIcle that was published in “Prosit” (and on Page 1 on the first page of Weygabg’s material ) are some flasks and wine “schraubflasche,” or “wine cans” (in his book, “Pewter of the Western World,” Mr. Hornsby calls them that! (he’s got to be English!) all made by the Weygang family. The two items are closely related as the molded relief side scenes are very much alike. I have included a few photos of some I have in the “From Which to Drink” collection, below. 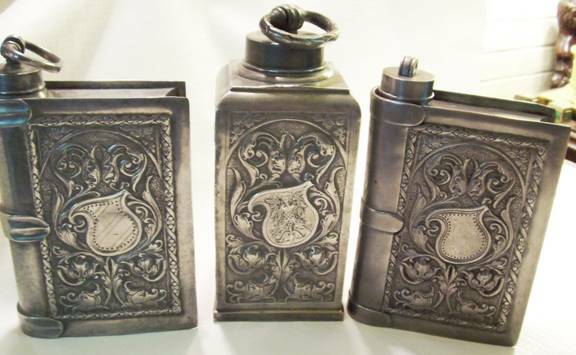 The two “molded relief” book flasks have additional background punch work that details the swirling leaf design, where as the “Schraubkanne or Schraubflasche” ( wine can) does not. 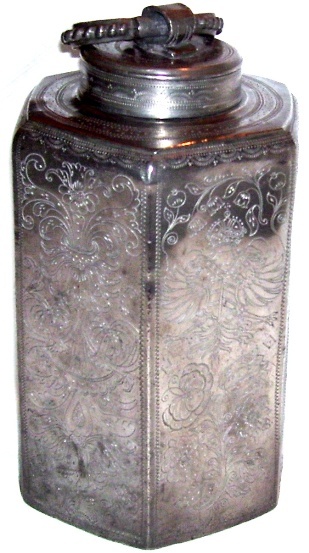 Dimensions of above: Book flasks= 7.75 INCH TALL (cap is an extra 1.75 inches [X] 6 [X] 2 deep. The wine can is 8.0 inches tall. 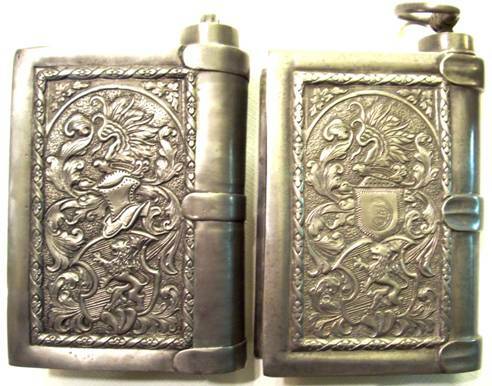 Below: the two “Book” flasks, shows the very small difference in design; notice the stripes on the shield on the right, and the difference of the 3 book binder clamps. 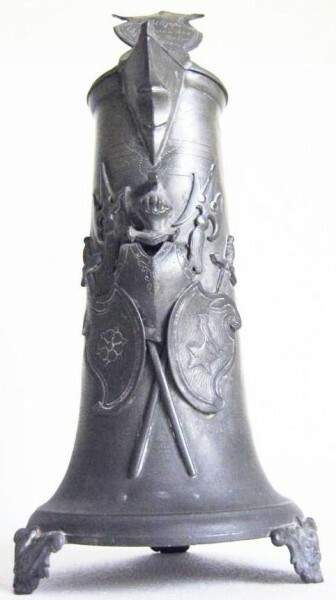 This Schraubflasche has an engraved (actually molded to look engraved) “Harpie” from the City Of Nuremberg; see the coat of arms below. The flask, above left, is noticeably newer than the other. I’d do a SWAG and say it’s a 1950-60’s version, while the older is perhaps from the period 1900 to 1920. The cap molding on the newer one is real rough and not finished as nicely as the older. It was missing it’s holding ring. Mr. Harr has made me an excellent copy! Both caps are stamped with a non-descript angel, in an oval mark. 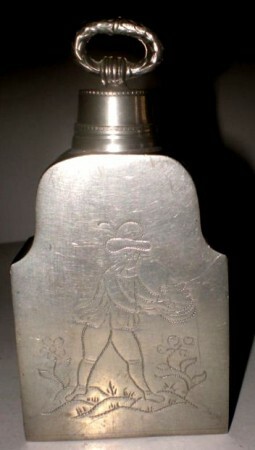 The eldest flask has a stamped religious (school ?) 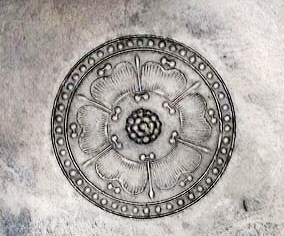 coat of arms within the center shield. Nürnberg / Nuremberg became a city in 1219 and became one of the most important cities in present Bavaria, in which it was included in 1803 (previously it was an independent city). 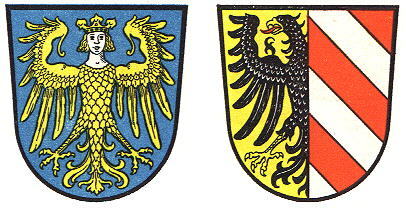 The city uses two different arms; the great arms with the eagle with a king’s head and the small arms with the eagle and red bends. Both were adopted in 1936. The great arms are derived from the oldest seals of the city, known since 1220. All great seals and secret-seals show the eagle with a king’s head. Smaller seals only use the imperial eagle. In architecture and other pictures the figure was often displayed as a harpy; i.e. with a woman’s head and breasts. 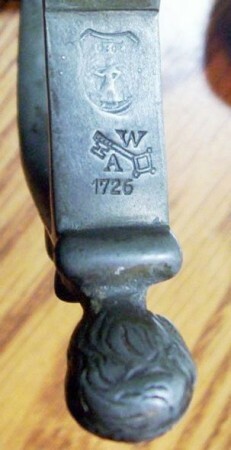 The present arms go back to the original seals. The origin of the figure is not known. The small arms are known as the real arms since 1240, where they are first mentioned. 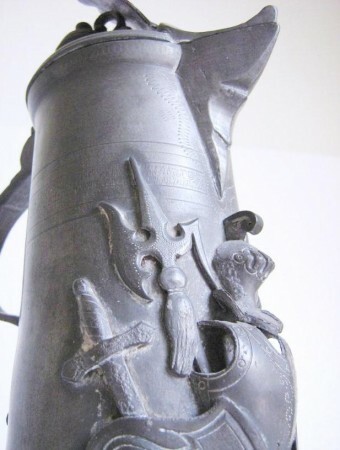 The arms showed a shield divided in 5 bends silver and red. The arms are probably derived from the arms of the first viscounts of Nürnberg. The demi-eagle, the imperial eagle, already appeared in pictures and architecture in the early 14th century. 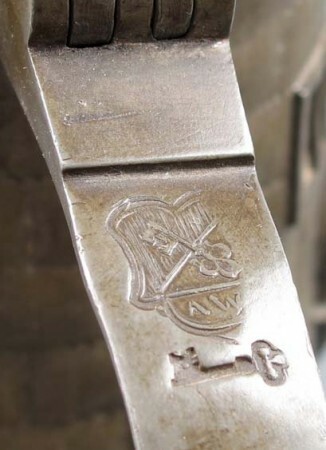 In some seals of possessions of the city (but not of the city itself) the arms are used since the 16th century. During the centuries the number of bends changed regularly and were finally fixed in 1936. Literature : Stadler, 1964-1971, 8 volumes; Hupp, O: Kaffee Hag albums, 1920s. 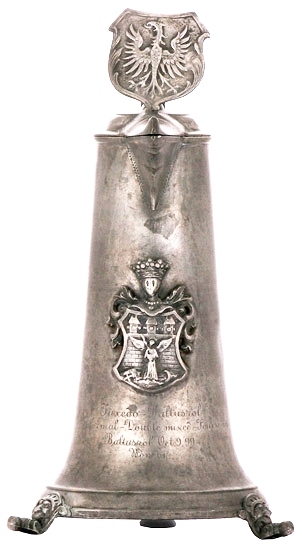 A Weygang minitaure “Schraubflasche,” about 4 inches tall, with detail of mark on bottom. 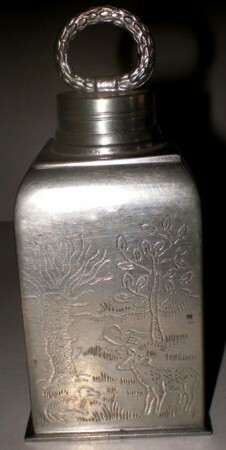 Another 4 inch mini flask by Weygang and its marks. BREWER’S OCCUPATIONAL – A later Weygang, the mark is stamped on the flat top handle. Not seen often. NURNBURG ARMS ON FRONT OF BODY. 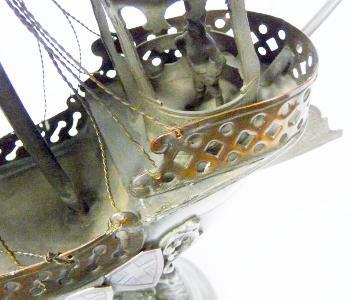 11.4 inches tall – Nurnberg Harpy on front body shield. 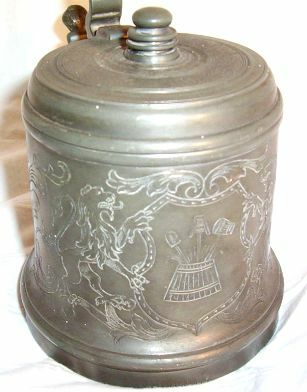 [R] This one appears to have lost the shield on the lid. This one may be by a Weygang contemporary. 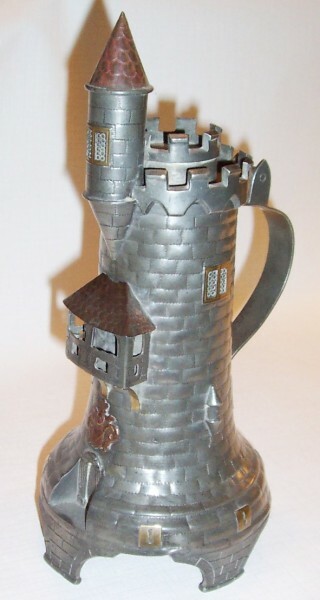 Check out the Dolphin shield supporter, which is seen on a lot of other pewter steins. 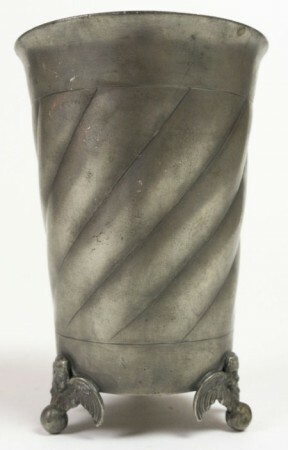 See Tab: Unusual stein thumblifts. About 1875 to 1920. Animals, dolphins. 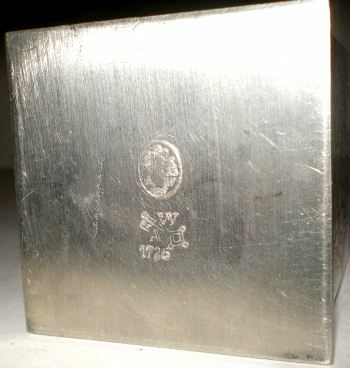 This one most probably is not a ‘Weygang’ stein but a true older one; placed here for comparison of those just above. One of Weygang’s largest servers. 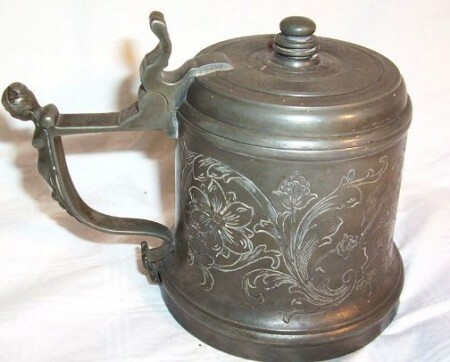 As with the Niche tankards these come with many different motifs. One of Weygang’s largest server, and now one of the most expensive to find. SOLD , and for only $400, July 2012 on EBAY. 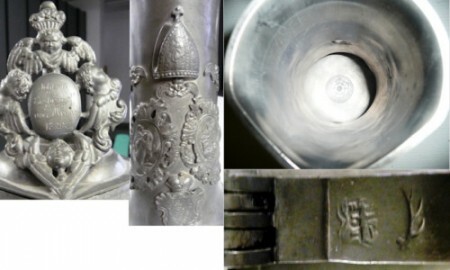 It carries the false date of dated 1673, and measures 23 inches or 58.5 cm high to the top of the finial. [L] The real mini server I bought = 101% of the size when displayed against the book’s illustration on the right. Another view of “Johann Archbishop of Mainz 1720”, shown just above. The marks and some details. 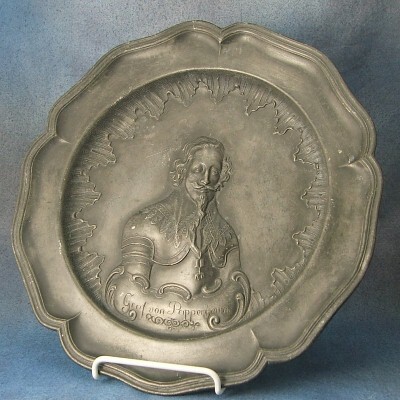 Profile of the “Graf (Baron) von Teppenhelm.” Same ‘dude’ on one of Weygang’s plates. 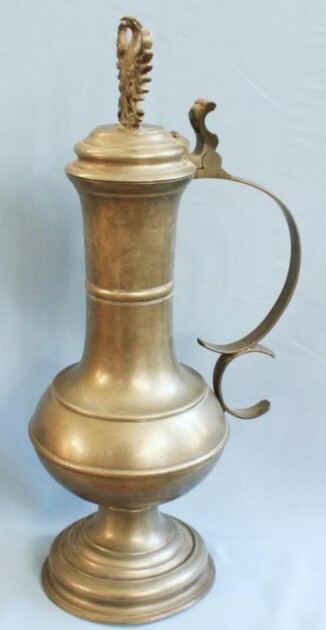 A Locksmith “Guild Cup” – 23 inches tall. These are so well made, they are often thought to be the real thing, even by some museums. 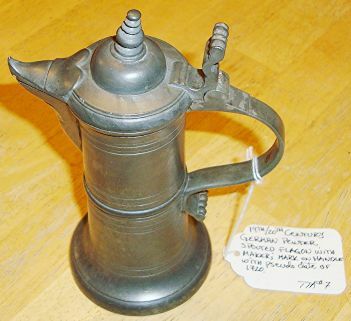 Years ago there was an elderly woman in NY City who had a stall at The Manhattan Arts and Antiques Center who sold only Pewter. (The MAA was / still is a great place to shop – if you have lots of bucks!) Her shop had 10’s of these Guild Cups and she was selling them as authentic. I never bought as the prices were so high, but I loved to look. 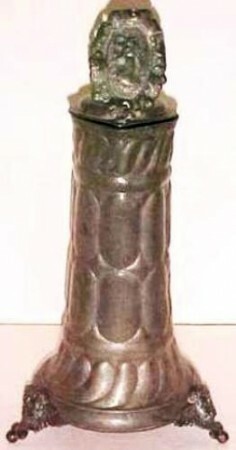 A Weygang reproduction Weaver’s Guild liquor dispenser. Dated 1617. 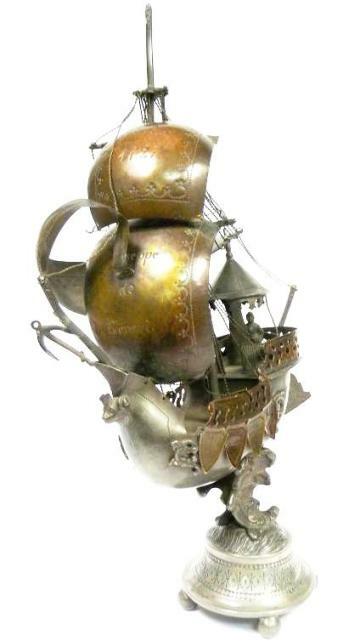 [FWTD] Well if you can’t afford the real thing (maybe about 5 grand in $$$’s) what the hell ….! 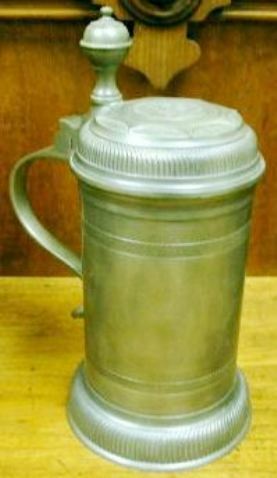 [L] An all pewter stein.The lid ‘s design is Circa early 1800’s “style.” Weygang used this lid and thumblift on their series of Fayence steins too, shown on right .